At the new Oakland Chinatown restaurant, enjoy traditional Shanxi-style knife-shaved noodles made by a third-generation noodle-maker. The Chongqing street noodle is one of the restaurant's mot notable dishes. Nearly every family has a closely guarded secret recipe — but how much money would it take for you to give up a family recipe? Chef Jimmy Hung of Huangcheng Noodle House said the restaurant's owner once offered him $30,000 for his grandfather's chili sauce recipe, but Hung turned him down. "My grandma said, 'Never sell it,'... [For a] cook, recipes are very important." Hung is a third-generation noodle-maker who specializes in traditional Shanxi-style dao xiao mian — knife-shaved noodles. The noodles are made to order by rapidly shaving noodles from a block of dough into a giant pot of boiling water. Hung starts preparing the dough for his noodles at 6 o'clock every morning, as he's done nearly his entire life. He also makes his grandfather's secret chili sauce, which he uses in many of the dishes on the menu, from scratch — on one visit, he proudly displayed giant bowls of just a few of the spices he adds to the sauce. Hung learned to make noodles in his father's noodle shop in China when he was young, then worked in a noodle shop in Las Vegas's Chinatown. 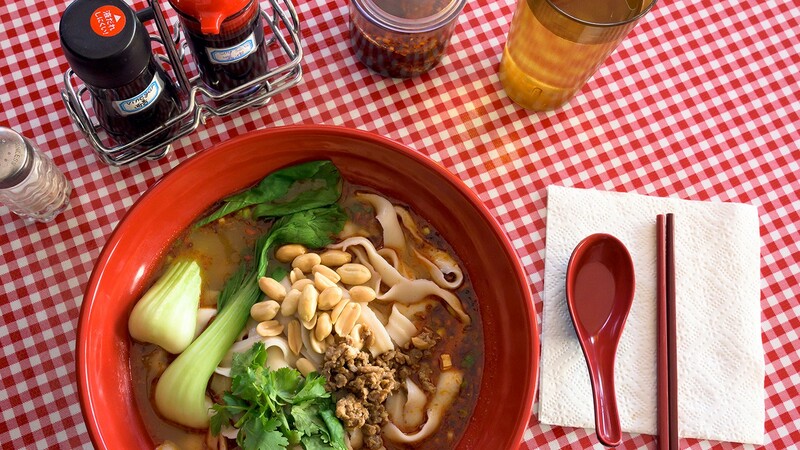 When that shop closed, the owner of Huangcheng Noodle House asked Hung to come to Oakland. Huangcheng Noodle House, which opened about three months ago, is one of the only restaurants in the East Bay that specializes in dao xiao mian. There are restaurants that sell other types of handmade Chinese wheat noodles, like hand-pulled noodles, but dao xiao mian are distinct. They're flat and wide, with delicate, ragged edges that give the noodles character — but overall, the noodles are surprisingly uniform, meaning that there are no undercooked doughy bits. "I tell employees ... [the food shouldn't just be] OK. Just perfect," Hung said. At Huangcheng Noodle House, pretty much any noodle dish can be made with these handmade noodles for no extra charge. One of the most notable is the Chongqing street-noodle dish, which is traditionally served with fine wheat noodles. Although they're pictured with the thin noodles on the menu, Hung serves it by default with thick handmade noodles, adding a homemade twist to a traditional dish. And while it's listed on the menu as a sauced noodle, it's really more of a soup. On one of my visits, the generous bowl was filled to the brim with a thick, eye-wateringly spicy red broth made using Hung's chili sauce, along with vinegar for a bit of tangy contrast, sesame oil to add body, and garlic, green onion, and sugar to round out the flavor. Meanwhile, peanuts and minced pork added savory bits of texture, and a single stalk of bok choy added a touch of freshness and relief from the heat. For those looking for a more comforting, milder soup, the beef sirloin noodle soup is an excellent choice. Hung said he boils beef bones for about 24 hours to make this soup, and slow-cooks the beef for about two. The broth had an opaque, milky richness without being too salty. The beef was served with tendon attached and was so tenderly cooked that the tendon melted away after a couple of bites. The soup also came with half a tea egg, which had a pleasant earthy, savory flavor. If you're not in the mood for soup, Huangcheng Noodle House also offers sauced noodles. The handmade noodles with mushroom sauce were a little overcooked on one of my visits, and the mushroom sauce, made with three different types of mushrooms, could have used a bit more salt. But I loved the noodles with pickled mustard greens and lean shredded pork, which were packed with tangy fermented flavor from the greens and a little richness from the pork to balance the vegetables. The twice-cooked pork noodles were also excellent. Bits of thinly sliced soft, fatty pork were scattered throughout the noodles, along with plenty of green bell peppers. Hung said the sauce is Sichuan-inspired, and in some ways, this dish is representative of Hung's background. Although his father was a noodle-maker from Shanxi, Hung's mother was from Sichuan and taught him how to make Sichuan-style food. While noodles are obviously the star at this noodle house, his mother's Sichuan influence is also evident throughout the menu. The cold-shredded potatoes are a popular Sichuan appetizer, finely cut and lightly fried so they retain a crunchy texture that's more reminiscent of a cucumber than a potato. With a little spicy sauce on top, they're like a healthier-tasting version of hot fries. Meanwhile, the Sichuan boiled sliced fish in hot sauce came in a gigantic bowl that made other customers look over at my table with envy. The bowl was chockfull of delicate, flaky sole fillets and a bit of Napa cabbage for texture. The broth looked like it had hundreds of chili flakes but still maintained a depth of flavor that spicy food sometimes lacks, although I found it a touch too salty. A bowl of rice on the side helped to tame the spiciness and saltiness of the broth. The cold chicken with chili sauce was another pleasant Sichuan-style surprise. Here, bone-in chicken was chopped into bite-size pieces and tossed in Hung's chili sauce. But despite the visible chili flakes, the dish wasn't too spicy, and had a nutty, toasty, and slightly sweet flavor that was especially refreshing when paired with the green onions and cucumber slices. It'd be the perfect dish to eat on a hot day. The only disappointment out of the Sichuan dishes was the sweet and sour pork ribs. Hung says this dish is omnipresent throughout Chinese cuisine, but originated in Sichuan. The slightly tough ribs came out in a brown sauce that was only a little sweet and not at all sour, while the photo on the menu showed ribs in a bright red sauce. The helpful waitress told me they could make them the way they looked in the picture, but it would involve a lot more sugar and some red food coloring. And that's just not how Hung does things at Huangcheng Noodle House. He makes everything from scratch using natural ingredients, the way he was taught by his father. Hours: Mon.-Sun. 10:30 a.m.-3:00 p.m., 4:00 p.m.-10:00 p.m.